Sweet love, sweet treats. 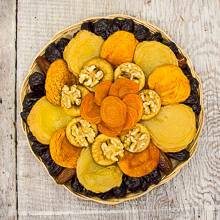 Surprise your loved one with a wonderful and delectable woven tray filled with a variety of fruits - Black french prunes, fancy jumbo peaches, fancy jumbo pears, fancy sierra figs, jumbo apricots, deglet noir dates, and hand-shelled walnuts. Net Wt. 32 oz. Ship Wt. 3 lbs. 12/7/2010 – Are your dried fruits prepared with sulfites?